No country is immune to economic turmoil. Venezuela was once known to be a rich country. But things gradually changed when failed government policies and central planning took over starting in the 1990s. The last straw to break the camel’s back was the falling price of oil in recent years. Food shortages, weak oil prices and economic mismanagement has forced the country’s government to declare a state of emergency. But how did Venezuela come to this point and what can the rest of the world learn from it? It all started during the socialist revolution. Hugo Chavez nationalized more than 1,200 private companies, landholdings and corporate assets in his 14 years in power from 1999 to 2013. Since the government controlled the means of production and distribution in the country, resources weren’t used as efficiently as they would be in a free market economy. Managing such a complicated system of goods and services under one central plan proved to be extremely difficult. Food became scarce, people couldn’t find work, foreign investment fled, and corruption ran rampant because the government had a monopoly on influence. 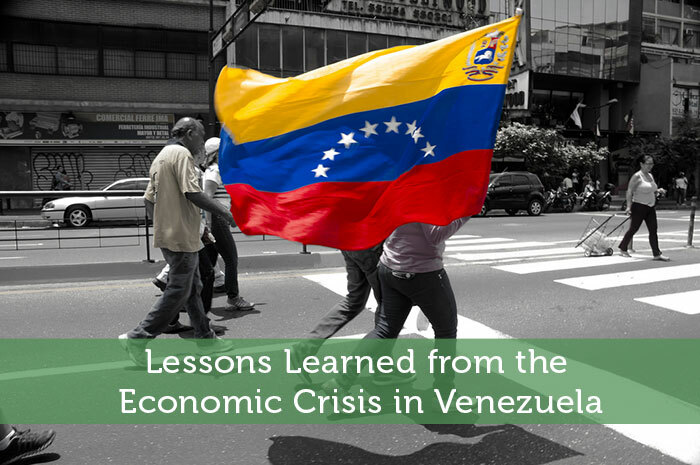 Even after Chavez was no longer president of Venezuela the economic turmoil continued. The country’s GDP shrank 4% in 2014, then down 6% in 2015, and is expected to shrink another 8% this year. The International Monetary Fund (IMF) said in a statement that “a lack of hard currency has led to scarcity of intermediate goods and to widespread shortages of essential goods—including food—exacting a tragic toll.” Around 31 million people live in the country and many of them simply don’t have access to proper nutrition. A year ago, McDonalds (MCD) restaurants in Venezuela temporarily ran out of french fries. The shortage of medical supplies means many infants and other sick patients are dying of preventable diseases and treatable illnesses. On July 16th, roughly 35,000 Venezuelans crossed the border to the neighboring country Colombia, in order to buy food and medicine. We can learn a lot from watching Venezuela’s problems unfold. Giving too much power to the government has not worked well for them. According to a leading pollster, only 1 in 4 Venezuelans approves of the current president’s governance. Most people who live in the country recognize that the socialist revolution was a failure. The only people who haven’t admitted it yet are the leftist leaning government bureaucrats. Central planning and socialism has never worked properly before anywhere in the world. Another thing we can learn from Venezuela is to not rely too much on one sector of the economy. Venezuela is a huge exporter of oil. But it’s oil revenue has plummeted since the oil crash. So the best way for a country to grow economically is to branch out and diversify into various industries.